Some who know Vance say that her path to U.S. attorney began 13 years ago, when arsonists burned three primarily African-American churches in Alabama’s rural Greene County, part of a wave of church burnings in the Southeast. At the time, Vance was an assistant U.S. attorney in the Birmingham, Ala., office. In the investigation, she worked with agents of the Bureau of Alcohol, Tobacco, Firearms, and Explosives, then trained at an ATF school in Georgia that teaches prosecutors about arson and explosives. She put this expertise to use on Jan. 29, 1998, joining the investigation after a bomb exploded outside a Birmingham abortion clinic, killing a policeman and critically injuring a nurse. “I could hear it go off,” Vance says. “We were on the scene almost immediately.” The bomber turned out to be Eric Robert Rudolph, who had also set off the 1996 blast at Centennial Olympic Park during the Atlanta Olympics. In the years since, Vance has investigated or prosecuted similar cases: gun trafficking between Alabama and the Northeast, bank robberies and bank fraud, and a man killed by a bomb planted in his riding lawnmower. Perhaps her most important prosecution was a civil rights conspiracy in Boaz, Ala., in which a police captain had his entire night shift taking money from Hispanics targeted for traffic stops. And she’s cool under pressure. On Dec. 16, 1989, her father-in-law, U.S. Circuit Judge Robert Vance Sr., was assassinated by a bomb disguised as a Christmas present that was sent to his home. His wife, Helen Vance, was severely injured. 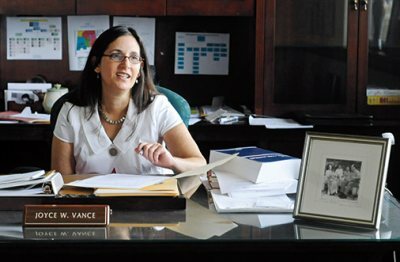 Joyce Vance’s longtime friend Leslie Proll recalls Vance being a “rock. She was very, very cool under very difficult circumstances.” Proll saw the same strength when Vance’s second son was born with DiGeorge syndrome, a genetic disorder, and needed immediate open-heart surgery. Vance learned to knit at age 4 — “I’m from a family of knitters,” she says — and when a friend needed yarn of a certain color, she rejuvenated a childhood hobby of dyeing yarn and fabrics. Her grandmother had taught her batik and tie-dyeing in the late 1960s, and Vance’s own approach to low-immersion fabric dyeing, which she calls “crackle dye,” is artistically and technically thorough, as evidenced by a detailed online article she wrote in 2006. In this sense, Vance finds satisfaction in the intricacy of the process, whether it’s dyeing fabric or creating a collage. “It’s the process that allows my subconscious to relax,” she says. Vance was raised mostly by a single mother in the middle-class Los Angeles suburb of Monterey Park. At a summer high school debate program at Harvard, she met Robert Branham, then a young Bates rhetoric professor and debate director. Vance’s own recollection of herself at Bates, however, is of someone more vulnerable. “My high school was not the best,” she says, and “it was clear to me at Bates that my education was not on that same level as my classmates.” She sees a young woman “struggling to learn about ways to think,” not someone who had a particularly positive assessment of herself. During this struggle, Bates became “the most wonderful sort of a cradle environment,” she says. Vance studied law at the University of Virginia and, in 1988, married law school classmate Robert Vance Jr., who is now a Jefferson County (Ala.) circuit judge. He is Episcopalian, and she is Jewish; their family celebrates both Jewish and Christian holidays. On Aug. 27, her investiture as U.S. attorney was held in Birmingham at the federal building now named for her late father-in-law. His widow attended. An Episcopal priest gave the invocation, a Reform rabbi the benediction. Also present was U.S. Attorney General Eric Holder, to whom Vance gave a copy of the Birmingham Pledge, a statement about confronting racism and prejudice. A few weeks later, Holder would elevate Vance’s stature by appointing her to his nine-member national advisory committee of U.S. attorneys. Jeff Hansen is a senior reporter for The Birmingham News.